Officials are asking people to leave firefighting equipment alone. Wildfires are seen from a Canadian Forces Chinook helicopter as Prime Minister Justin Trudeau views areas affected by wildfire near Williams Lake, B.C., on Monday, July 31, 2017. 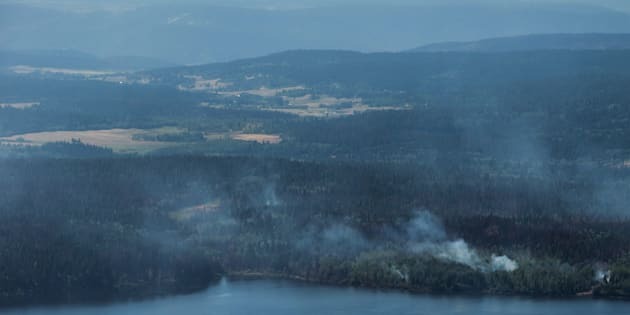 VICTORIA — Crews battling aggressive wildfires across British Columbia have been faced with hot weather and difficult conditions, but officials say the theft and damage of equipment is the most frustrating challenge yet. RCMP spokeswoman Dawn Roberts said the force is investigating a number of thefts and acts of mischief related to fire suppression, including incidents targeting local fire stations and trucks used in fighting the wildfires. "These are criminal acts and they're seriously impacting the safety of others, including our emergency personnel and the public," she said in a conference call on Friday. "We're asking people if they come across firefighting equipment to do the right thing and leave it alone." The BC Wildfire Service has said a water pump and 10 hoses were stolen from crews fighting a wildfire northeast of Nelson late Monday or early Tuesday. The sun is obscured by smoke from wildfires in the distance behind burnt trees in Williams Lake, B.C., on Sunday, July 30, 2017. With so many fires burning across the province, equipment has been spread thin and the wildfire service has had to bring in more from partner agencies, said chief fire information officer Kevin Skrepnek. "Obviously in any situation the theft of equipment is reprehensible, but especially with what we're dealing with right now," he said. "We'll make up for the equipment and we'll get it into the hands that need it, but it's definitely frustrating." We're asking people if they come across firefighting equipment to do the right thing and leave it alone. About 3,800 people were fighting more than 120 fires across the province on Friday. Flames threatened a number of communities, prompting 27 evacuation orders and 41 evacuation alerts, where residents have to be prepared to leave at a moment's notice. Provincial officials banned off-road vehicles from three regions Friday in an attempt to prevent a spark, or hot tailpipe, from igniting extremely dry fuel in the forests and grasslands. ATVs, dirt bikes and other off-road vehicles are prohibited from Crown land in the Cariboo, Kamloops and Southeast fire centres and all on-highway vehicles have been directed to stay on the defined road surfaces. Obviously in any situation the theft of equipment is reprehensible, but especially with what we're dealing with right now. The new restrictions come as the provincial government extended the state of emergency declared in response to wildfires. It's the second time Premier John Horgan's government has rolled over the declaration and this extension will run until Aug. 18. "This is, by everyone's measure, the worst fire season since the 1950s," Horgan said at a news conference. "We need to make sure we keep people safe, we keep property safe. And then we'll address the long-term consequences when we have the opportunity." The declaration ensures the delivery of federal, provincial and local resources is co-ordinated and public safety is maintained. It also means the more than 7,000 people still displaced due to evacuation orders will continue to receive $600 per household in funding for every 14 days they're out of their homes. The state of emergency was first issued on July 7. More than 870 fires have been sparked across B.C. since April 1, scorching an estimated 5,090 square kilometres and costing the province $211.7 million in fire suppression efforts. The Metro Vancouver regional district also issued a warning Friday to its residents that an extreme fire danger rating has been put in place for all parks in the region. All but two of the district's parks will remain open. "We encourage residents to head out and have a fun B.C. Day long weekend but to be mindful of the effects this heat is having on our region," said Greg Moore, chairman of the regional district in a news release. "We now have an extreme risk of fires, and an ongoing air quality advisory in place, so please be vigilant and take the necessary steps to stay safe." Smoke from the fires has lowered the air quality in much of southern B.C. Environment Canada has issued air quality advisories from Crowsnest Pass, Alta., to the east coast of Vancouver Island and from Prince George south to the Canada-U.S. border. The agency said smoke concentrations will vary widely as winds, fire behaviour and temperatures change, but strenuous outdoor activities should be avoided.